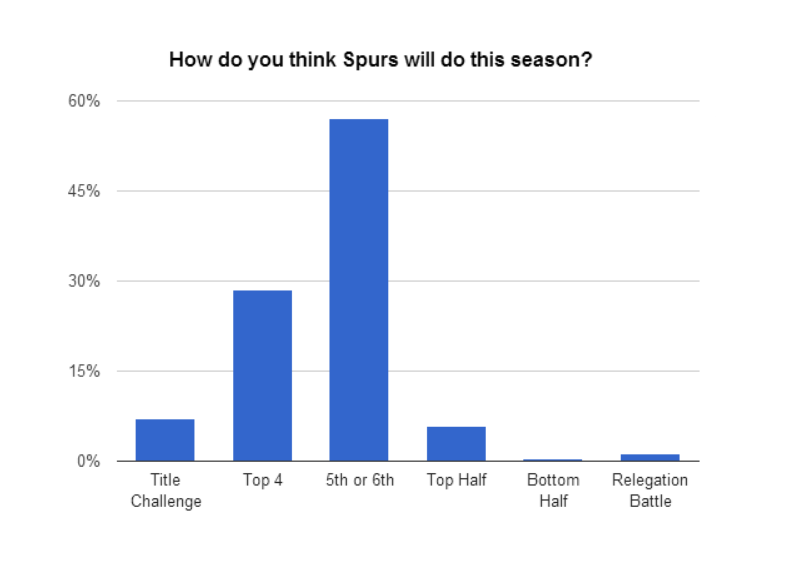 I polled readers before the start of the season, to find out Spurs fans expectations for the new campaign. Thanks to the 628 who participated. The results inidicate supporters are optimistic about the team’s chances – over 92.5% of those who took part think Tottenham will achieve the same place or better than last season. However most people are also fairly realistic about our prospects, with a finish just outside the Champions League places, the most popular prediction. Over half the votes (57%), were for “5th or 6th”, which is how I voted. With United potentially stronger than last year and Everton still a tough prospect, this would represent a reasonable first year under Pochettino. Second most popular was “top 4”, with more than a quarter (28.5%) choosing this option. In fact more than a third (35.5%) are anticipating a return to Champions League football. If Tottenham add a couple of players before the transfer window shuts and Pochettino makes an immediate impact, I wouldn’t rule out a challenge for third or fourth place. A very small number expect a return to the dark days of the 90s, with a finish in the bottom half (0.3%) or even a relegation battle (1.3%). 7% of you even thought that a Spurs title challenge is on the cards. I hope you’re the ones eventually proved right! Spurs got off to a winning, if slightly unconvincing start to the new season, with a 1-0 victory over last year’s bête noire, West Ham. Read my match report here. This entry was posted in General Thoughts and tagged football, Poll, Premier League, Spurs, Tottenham Hotspur on August 18, 2014 by Jon @ AnythingButPenalties.